1. 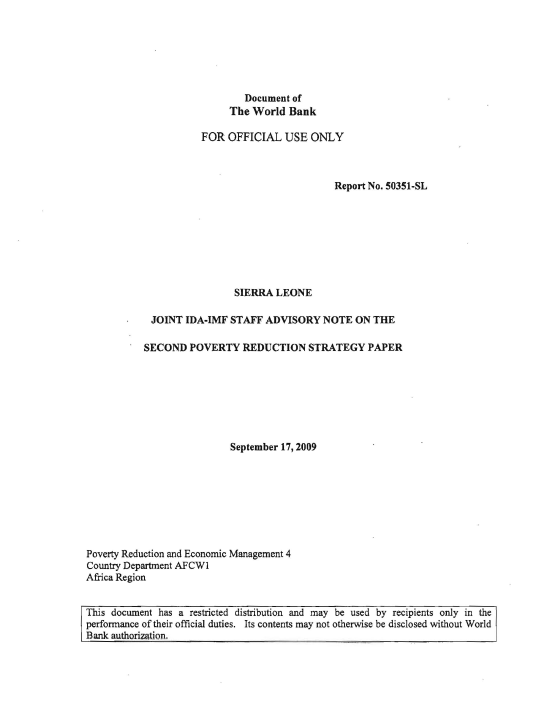 This Joint Staff Advisory Note (JSAN) reviews Sierra Leone’s Second Poverty Reduction Strategy Paper (PRSP-H) covering the period 2009-2012, The PRSP-I1 examines achievements and lessons learned under the first PRSP, analyzes challenges and constraints in the economy, and lays out the strategic priorities for accelerating growth and reducing Poverty. 2. The PRSP-II presents a comprehensive medium-term strategy that focuses on four strategie priorities. These are: (i) enhancing the national power supply: (ii) increasing agricultural productivity and competitiveness; (iii) significantly improving the national transportation network: and (iv) promoting sustainable human development through decentralized service delivery. These priorities are underpinned by good governance, macroeconomic stability, private sector development, financial sector reform, and natural resource management. 3. The preparation of the PRSP-II included a purticipatory process involving central and local government, civil society, development partners and parliamentarians Contributions from key ministries and agencies were shared with development partners, civil society organizations, and parliamentarians. Regional workshops were attended by a wide range of stakeholders. Agriculture was identified as the number one priority and recommendations resulting from the consultation process indicated the need for more explicit coordination between the transport and agriculture sectors, particularly concemning investments in feeder roads, whose current condition is a major impediment to agriculture. After a series of consultations with key ministries and development partners, the PRSP-II was then validated at a national stakeholders’ meeting, approved by Cabinet and later endorsed by the Parliament. To ensure continued ownership of and support for the Government’s refonn program, it will now be important to embark on a wide dissemination of the strategy to broaden stakeholders’ awareness and to similarly involve all levels of society in monitoring the progress of the PRSP-II implementation. 4. As noted in the PRSP-II, progress during the implementation of the PRSP-I (2005-2007) has been mixed. The country maintained a stable macroeconomic environment with strong economic growth, moderate inflation, declining current and fiscal imbalances, an increased level of foreign reserves, a stable exchange rate and a reduced external debt level. The public financial management system improved and some aspects of the budget process have been strengthened. Implementation of the decentralization agenda advanced with 19 out of 34 functions devolved. The National Anti-Corruption Strategy (NACS) was revised to include much stronger legal power for the Anti-Corruption Commission and this is now being implemented. Major reform efforts were undertaken to simplify administrative procedures and reduce the cost of doing business in Sierra Leone. Progress was made on access to education as the net enrollment increased, although the desired/required pupil-teacher ‘ratio target was not achieved. Access to health facilities improved over the years, but infant and maternal mortality figures remain among the highest in the world. 5. The Government bas reflected the lessons learned during the implementation of PRSP-I in the PRSP-II. Specifically, it notes the following key lessons: (i) targets in PRSP-I were too ambitious compared to available resources; (ii) inter-sectoral linkages among various units in different sectors were weak; (iii) program implementation was not always aligned with national priorities; (iv) there was no clear strategy for resource mobilization from the development partners; (v) implementation capacity was weak in many ministries, departments, and agencies (MDAs); (vi) many MDAs did not fully implement the programs of the PRS because they viewed it as a product independent of their own obligations; and (vii) lack of timely and reliable statistics made the assessment of the baseline data difficult and, as a result, targets were unrealistic. authorities prioritize their interventions during its implementation. 23. The education strategy is consistent with the recent Education Sector Plan. It puts forward a vision emphasizing access to basic education quality of teaching and learning, and strengthening capacity to manage the education system. Staffs agree that impressive gains have been made on increasing access to basic education and that the need is to focus on teaching and learning materials, and strengthening management capacity. 24. Staffs, however, note that much effort is required to increase the number of qualified teachers, especially in deprived areas. For this, pre-service training would need to target more teachers and in-service training be designed to count towards credits for teacher certification. Expanding the distance education program would also need to be vigorously implemented, since distance education has been observed to be more cost effective and capable of reaching larger numbers of trainees. Providing incentives for teachers deployed to deprived local councils will require the detennination of clear and justifiable criteria for those deployed. Currently, a significant proportion of teachers teaching in deprived areas is unqualified and untrained and, in addition, is not even on government payroll. A comprehensive teacher recruitment, deployment and pay policy is required to address these issues. 25. Staffs also note that additional effort is required to sustain the gains made in setting up an Education Management Information System (EMIS). Two education censuses were undertaken for 2006 and 2007 and there is the need to fund and support continued education data collection and analysis. There is also a need to build capacity for planning, data collection and analysis into the EMIS activities from the school level to the central level of education administration. Staffs observe that, in the last two EMIS, data was collected and analyzed but was only used for policy decision making mostly at local council and school levels. To ensure that data is used at all levels, staffs recommend that it be disseminated comprehensively.